We have only you, our dear customers to thank for the recent honour that has been bestowed upon us! 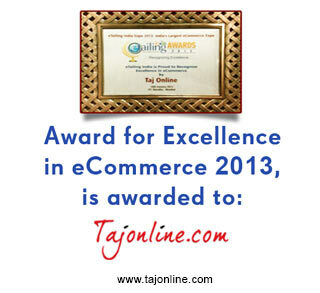 Tajonline.com is very happy to announce that we were awarded the 2013 Award for Excellence at the recently held eTailing India- Voice of Indian eCommerce at the Mumbai summit. Tajonline.com is one of the pioneers in the Indian eCommerce industry and have over 14 years of experience in serving customers across the globe. It is only the support and love of our customers that keeps us going and makes us strive to constantly improve our products and services. Over the past year we have continued to grow and our customers have been with us every step of the way. We are grateful for the recognition we have received from the recently concluded eTailing India EXPO for our constant dedication to excellence. We hope that you will continue to support us over the coming year and make 2013 a mutually fruitful year of Happy Gifting! 3 Cheers for our Customers!